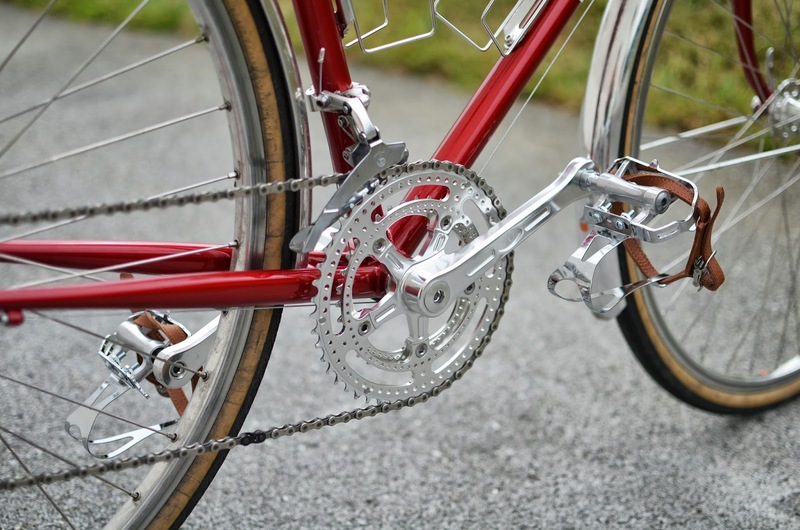 Dropouts on the Camargue. Super beefy. Drillium rims for the fixies? In other news, we were greeted early this morning with a container of products. 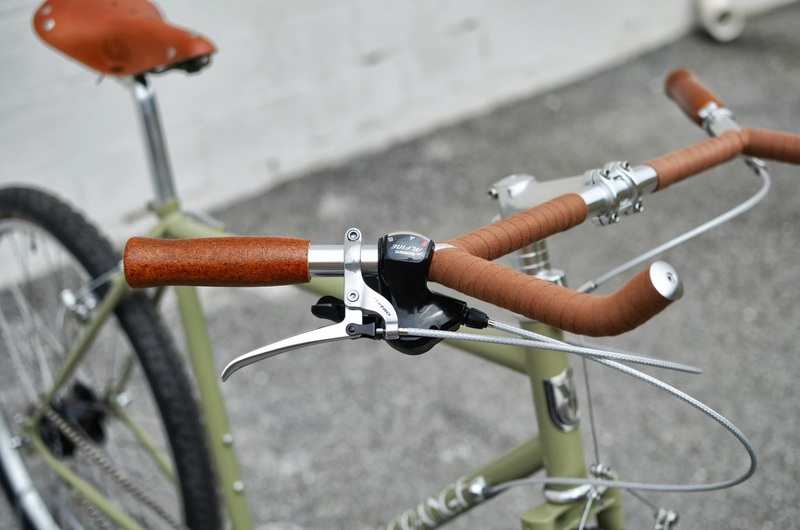 Some of those boxes had items we've been waiting patiently for: our new Grand Cru Lock-on Leather Grips. Available in black or brown leather, chrome ends, laser etched Grand Cru logo, and classy stitching. 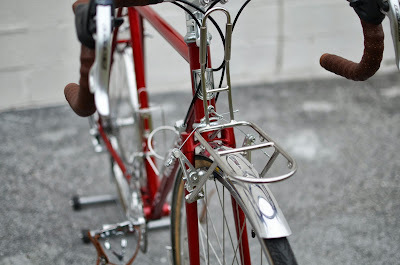 Stylish and easy to install on 22.2 handlebars. As we go through the rest of the boxes, we will put products back in stock and adjust inventory. 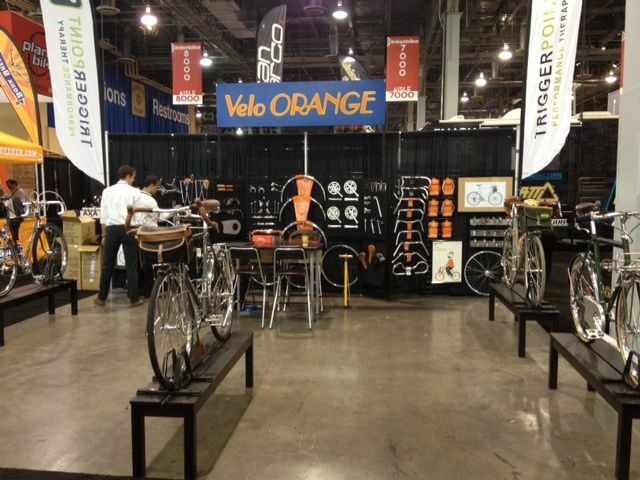 For Velo Orange, the new year begins in September at Interbike. New frames, new items, and new prices all are unveiled at the show. Yes, a few of our prices will increase today, but not dramatically - there shouldn't be any sticker shock. Costs of goods usually increase over time; certainly freight costs do. We try not to adjust prices mid-year (from September to August), so a few of these hikes are well overdue. your shipping address is outside the continental US. For international orders, we will continue our long-standing policy of individually rating each package and notifying you of shipping options. Interbike Week and New Pocket Knives. 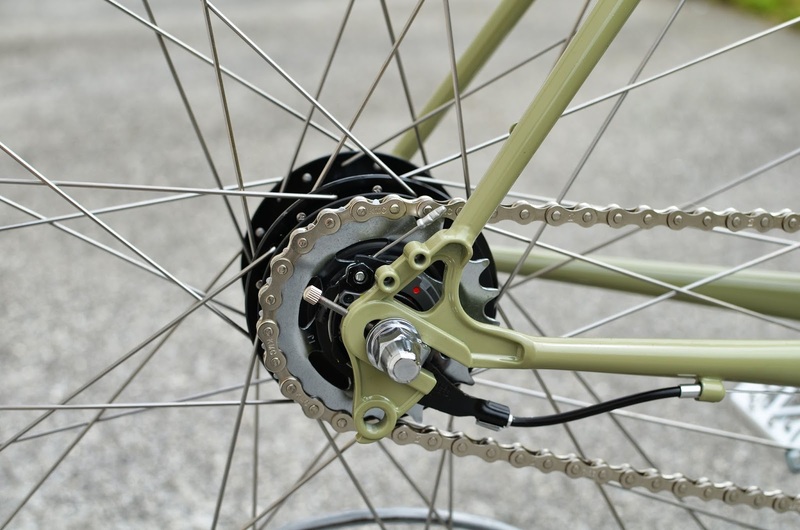 This week's Interbike show, along with Eurobike and the Taipei Cycle Show, are the big three trade shows in the bike world. As usual, we'll be exhibiting there. If you're with a shop that already stocks VO parts, or are interested in stocking them, please drop by our booth, #14008. Several of us have already left for Las Vegas to set up our display. I leave tomorrow. This means that for the rest of the week there'll be no one here to answer technical questions. So if you need answers please e-mail us and we'll try to respond each morning before the show opens. There is no phone tech support this week, sorry. The shipping department is unaffected so orders will ship with the usual promptness. In other news, we decided to stock three new Opinel knives. Folks really do love them and they've been selling briskly. Everyone on our staff now has at least one. I wrote more about them here. We're stocking these three additional models mainly because various members of our staff wanted them, so we thought some of you might also. 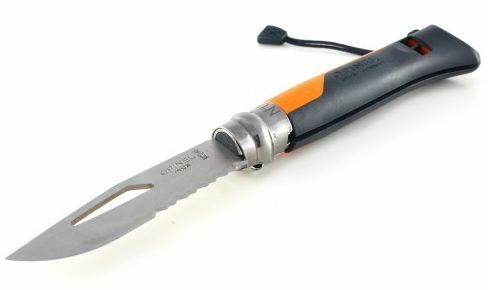 We have a new 12cm slim knife for the several fishermen here, myself included. The stainless steel blade is perfect for filleting or cleaning a trout or other small fish. It's also nice if you just desire a longer blade for camp cooking. The expedition version of the classic No.8 features a lightweight plastic body, orange of course, with an integrated whistle. The blade is stainless with a serrated base and shackle key. The cord end is a nice touch for quick attachment. The wooden handles of traditional knives can swell if they stay wet for a long time, so this knife is recommended for kayakers, sailors, and folks in very wet climates. Finally, and we know this is a real niche product, is a special version of the #8 stainless steel knife made for mushroom hunting and foraging, something a few of us here at VO enjoy doing. It has a curved blade that will cleanly slice off a mushroom, fruit, greens, and many other things that you may find or grow. The boar bristle brush is used to clean the dirt off delicate mushrooms. 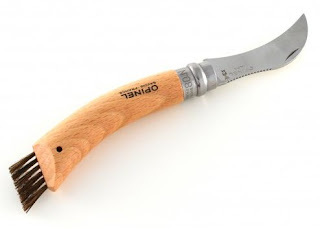 This knife is also very useful for light pruning duty in the garden. Okay, enough about knives. We have another container arriving soon with new bike stuff to write about. Here are two production Pass Hunter frames. 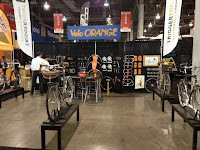 We had them air-shipped to display at Interbike. The sea shipment with the rest of the frames is still a few weeks out. 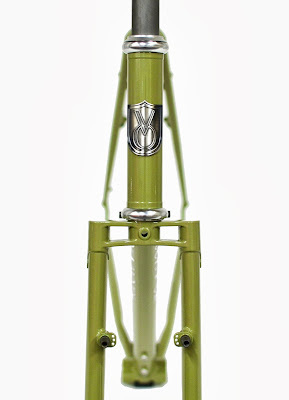 Prototype photos are here. Geometry can be found here. 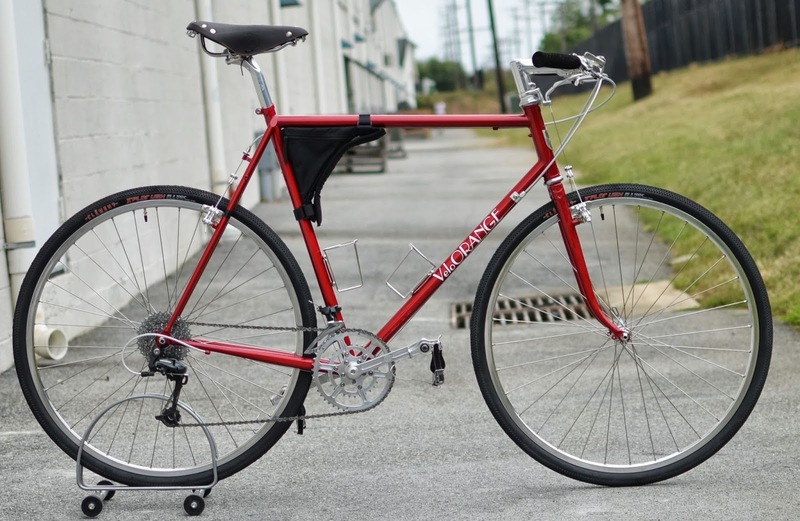 This frame is built as a lightweight Japanese-style flat bar pass hunter, Intended for hunting mountain passes on paved or dirt roads. To save weight, no fenders or racks are installed. Postino bars and VO shifter mounts make for a comfortable cockpit. 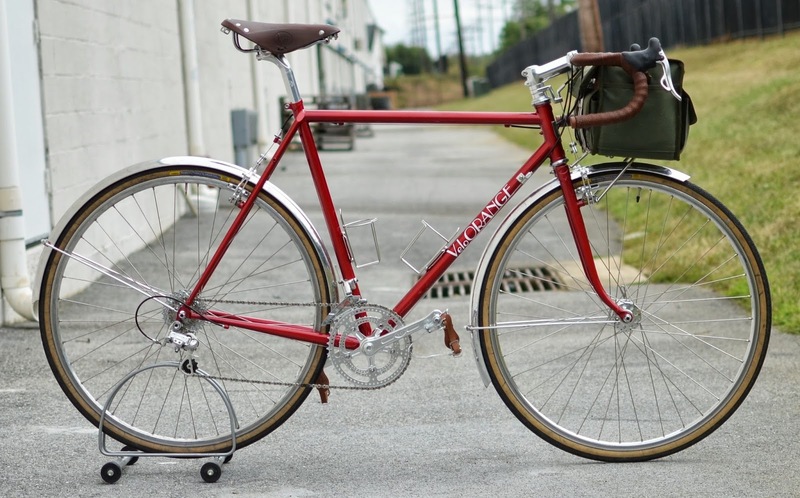 Here's one built as as a randonneuse, as I suspect most will be. Isn't that a cool fork crown? 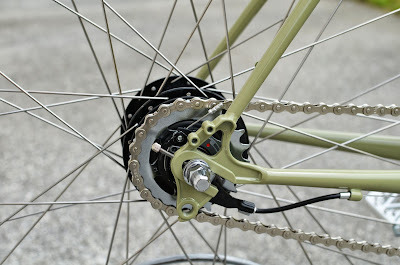 Drillium with silver Campy drive train looks fast. 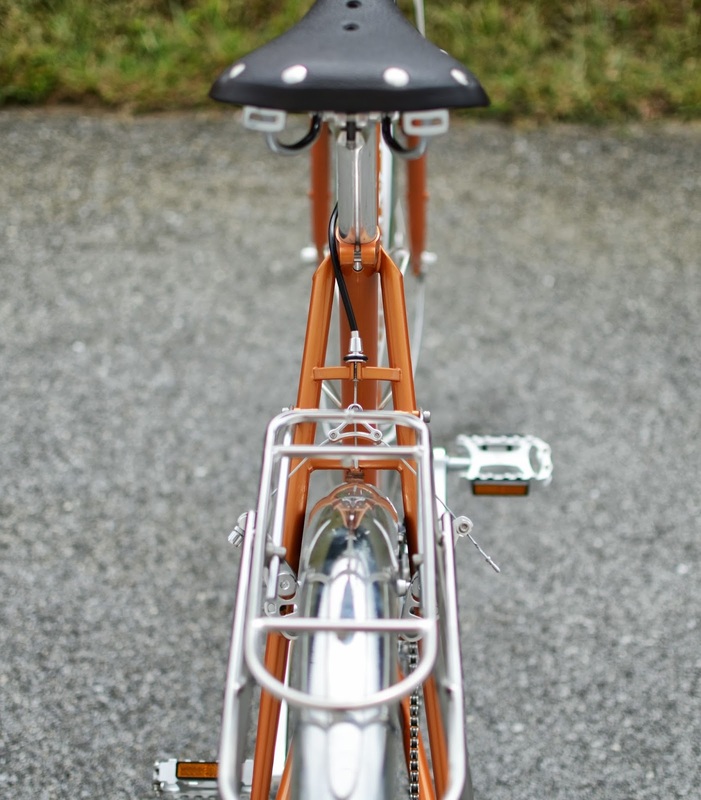 Note the seat cluster and rear rack mount. 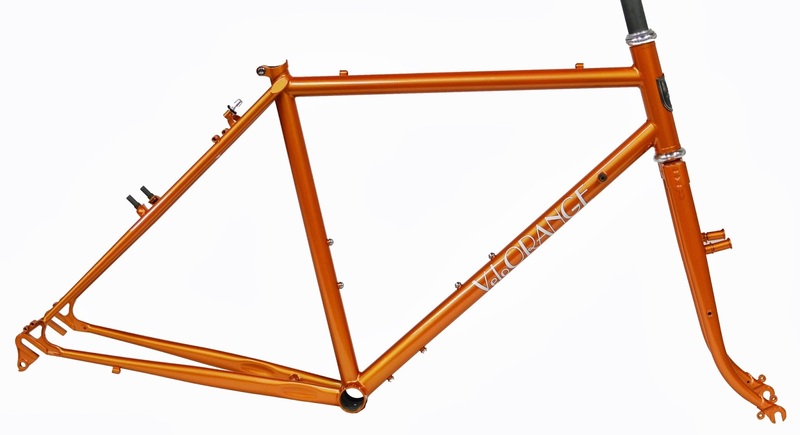 Here are a few images of built up Camargue frames. 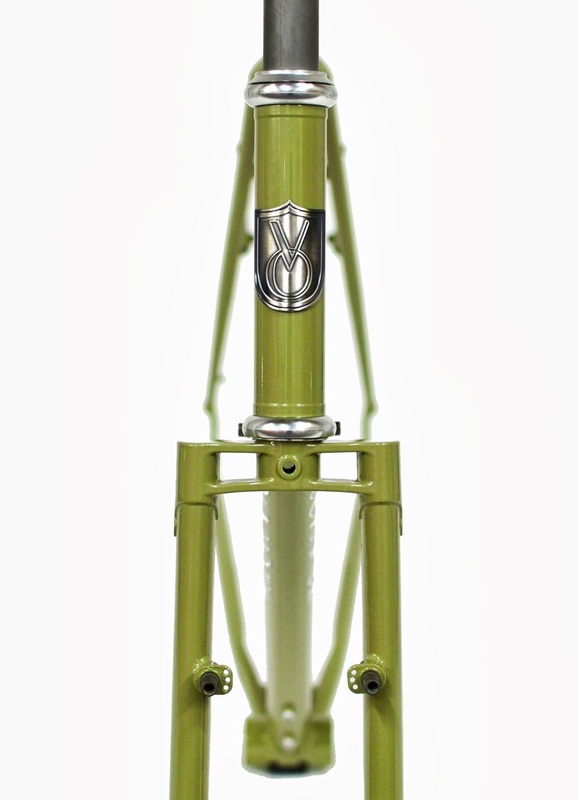 These two are being shipped off to Interbike. 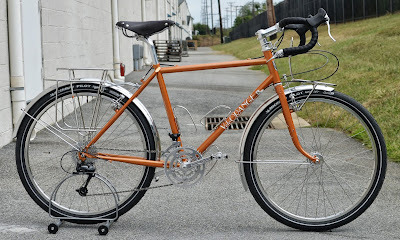 Here is the 26" version set up for touring. The Pass hunter rack is not a good fit; Campeur or Constructeur racks are the way to go on these frames. 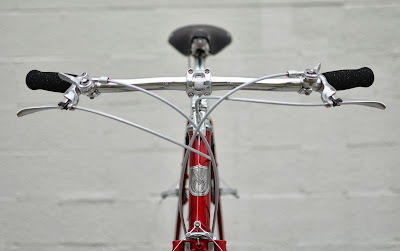 Note the cable adjuster and proper fender mounts. Again, fender mounts and three bottle cages. Those 2.0" smooth Michelin tires are so comfy. 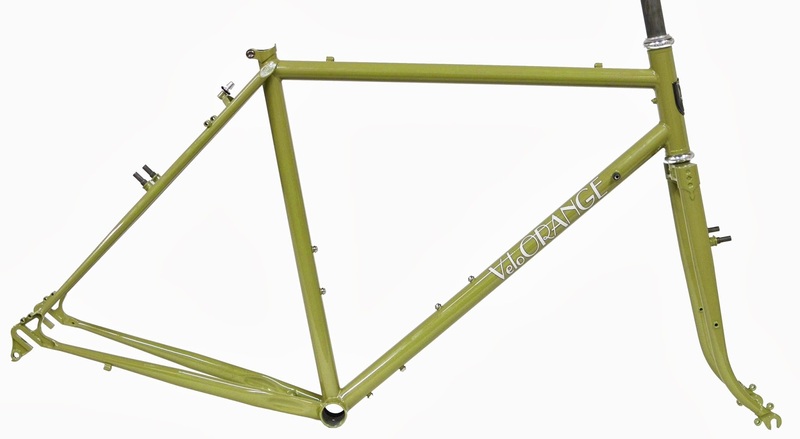 The new VO frame is like a Campeur for folks who favor off road touring. It's not officially named yet, but it'll probably be called the "Camargue," after an ancient breed of French horse reputed to be especially rugged and intelligent. 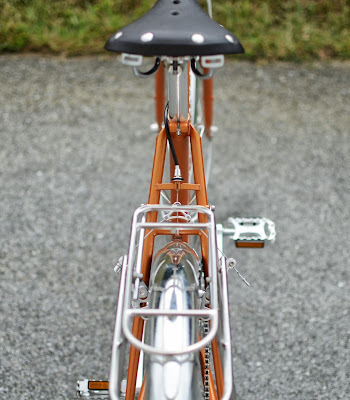 Metal headbadge and bi-plane fork crown. 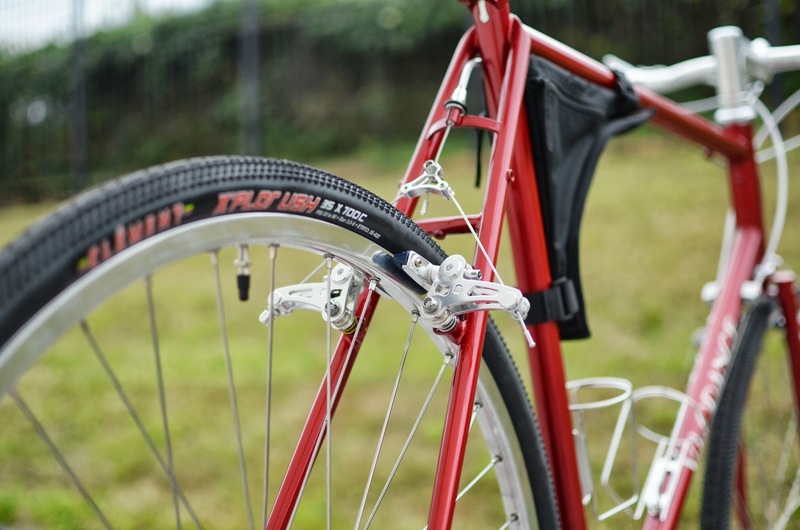 2.1" (55mm) tires fit with fenders, 2.3" (60mm) without. 700c wheels on sizes 62, 59, 56 and 26" wheels on 53, 50, 47. 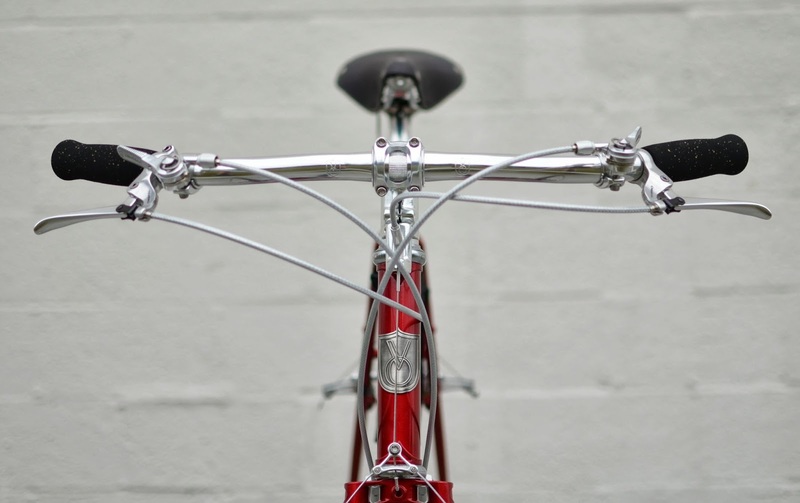 Geometry is designed to handle like the much-praised Campeur. 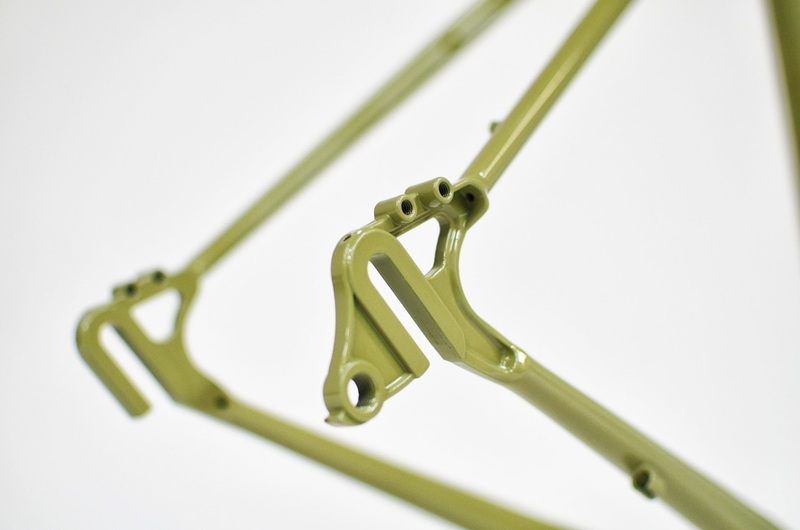 This frame is not suspension corrected, allowing us to better fine tune handling. Super beefy horizontal dropouts (so you can use internal gear hubs). 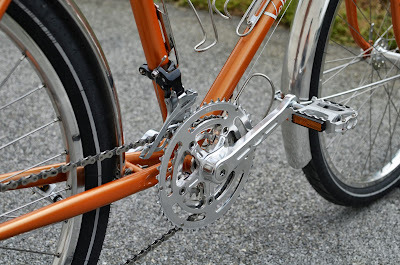 All the braze-on bits that come on the Campeur: three bottle cages, threaded fender mounts, rear brake adjuster, thru-fork low-rider mounts, double eyelets front and rear, etc. Sage green color based on my original custom Pass Hunter. This color was originally inspired by an ancient type of Japanese plaster. 4130 cro-mo double butted tubing. 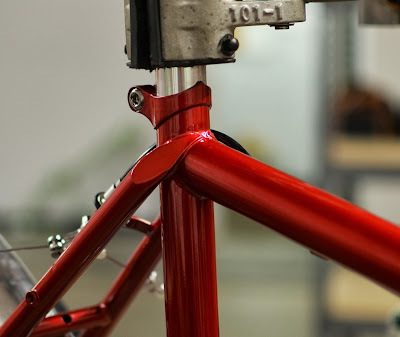 Extra wide bi-plane fork crown with extra clearance (guaranteed to plane). These photos are of two prototypes. The orange one is a 53cm, the green is a 59cm. We hope to have the production frames ready by mid-winter. 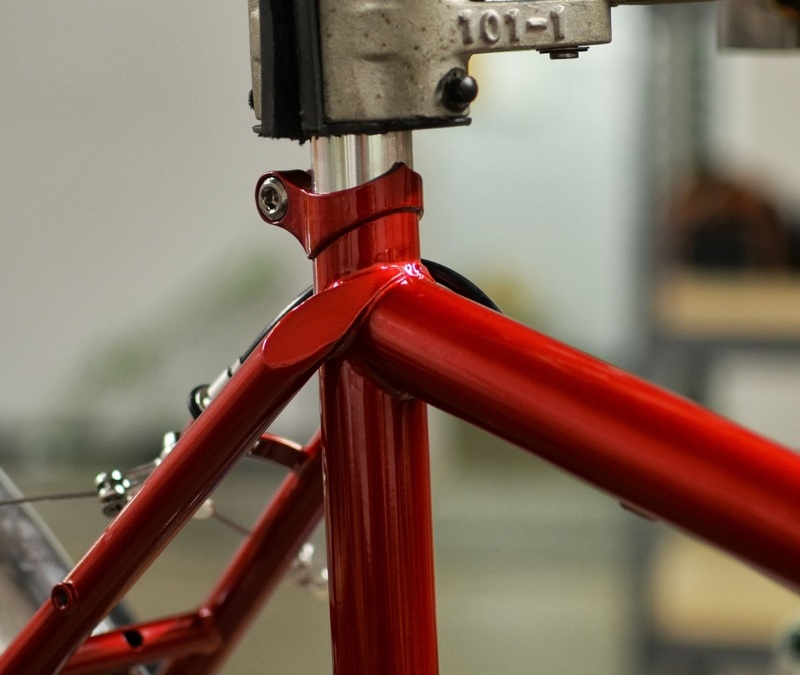 We'll post photos of built-up bikes soon. This frame does not replace the Campeur, the frame which I would choose for primarily on-road touring. 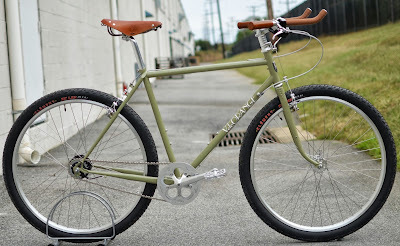 Rather, it is designed for bike-packing and serious off-road touring, and for those who just like big tires. Unfortunately, the orange looks a lot better in photos than in person.